The South Loop Chamber of Commerce honored The Zhou Brothers at its annual fundraiser Thursday night for their commitment to creating and developing Bridgeport’s booming art scene. ARMOUR SQUARE — At its annual fundraiser Thursday night The South Loop Chamber of Commerce honored The Zhou Brothers for their commitment to creating and developing Bridgeport’s booming art scene. In the Bard's Room in U.S. Cellular Field, ShanZuo and DaHuang Zhou received commemorative boards saluting them for their dedication to art. Cook County Commissioner John Daley offered a few words praising the brothers, who moved to Chicago in 1986 with suitcases filled with paintings and later opened the Zhou B. Art Center, a place for artists to practice and display their work. The Zhou Brothers were brief in their response. 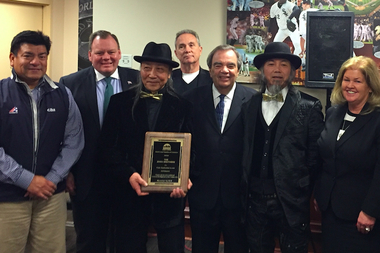 Mayor Rahm Emanuel recently dedicated a street sign — “Zhou Brothers Way” — to the brothers at 1029 W. 35th St.